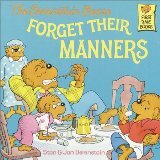 The Berenstain Bears Forget Their Manners is another didactic story, telling how Sister and Brother and Papa Bear behave rudely, and poor, saintly Mama Bear must bring them back from the brink of barbarism. The story, such as it is, is simple and direct. Mama’s family is behaving rudely, and she will not stand for it. She tries coaxing, complaining, and shouting, and she tries enlisting Papa Bear to shout at the children, and none of these things cause them to be more polite. Eventually, she creates “The Bear Family Politeness Plan,” a list of ‘rudenesses’ and ‘penalties’ that she hopes will effect the changes she wishes to see. The cubs, too clever for their own good, decide that they will be so overly polite that Mama will get sick of it and give up on the whole idea. Their plan doesn’t work, and eventually they’re just polite out of habit. Mama wins again. It’s probably clear from my tone that I don’t care for this book. As entertainment, it is a failure. I suspect that its sole purpose is as a prop for parents to justify similar ‘politeness plans’ for their own children. Worse still, Mama Bear feels justified in shouting at her children, and enlisting her husband to shout at them and bang on the table in an intimidating display, just to enforce her ideas of ‘politeness.’ This is, to my mind, a far greater crime than ‘playing with food,’ ‘hogging bathroom,’ or ‘rude noises,’ three of the items on the list of ‘rudenesses’ that she was so concerned with. The art is competent, but nothing special, and frankly the illustration of Papa shouting at the children as they are trying to eat, and beating his fists on the table so hard as to upset the tableware, is fairly unsettling. Unlike the other Berenstain Bears books, which have been (in my experience) at worst boring, I think this book represents a certain kind of evil, implying that parents are justified in using intimidation to enforce their will upon their children. I would counsel against acquiring this book for any child.